Members of the School of Nursing community—including Dean Pamela Jeffries, administrative leaders, faculty and students—cut the ribbon on a new skills and simulation laboratory Tuesday at the George Washington University’s Virginia Science and Technology Campus. The 3,000-square-foot Johnson Lab, named after SON founding Dean Jean Johnson, increases the school’s lab space to more than 10,000 square feet. Billed as a virtual hospital, it includes beds for 10 patients, populated by static and mid-fidelity mannequins that simulate patients from infants to the elderly. The static mannequins are for specific tasks, while the mid-fidelity mannequins include more lifelike features such as pulses and heartbeats. As with the existing simulation space, the Johnson Lab provides an environment for nursing students to practice the full scope of their study, Dr. Jeffries said Tuesday. That is something they cannot do during clinical training with real-life patients, where the instructor steps in when something goes wrong. A longtime advocate for using simulations to bridge classroom learning and real-life clinical experience, Dr. Jeffries is nationally known for her research and work in developing simulations and online teaching models. Patient-centered care is the foundation of Dr. Jeffries’ vision for the school as it celebrates its five-year anniversary this fall. The school has doubled its enrollment since its 2010 founding to more than 800 students and is recognized among the top 50 schools of nursing in the country by U.S. News & World Report. Its online Master of Science in Nursing program is ninth among more than 130 programs nationwide. Under Dr. Johnson’s leadership, the school became an early adopter of online programs, increased educational access for military service members and forged partnerships with Virginia community colleges. Dr. Jeffries is looking to expand the school’s online presence and develop a nursing Ph.D. program. In addition to Tuesday’s ribbon-cutting ceremony, the school is celebrating its anniversary with several events, including a discussion on health care reform on Nov. 16 featuring Mary Beth Bigley, a member of the GW SON faculty. That event will be followed by an anniversary reception in the City View Room on the seventh floor of the Elliott School of International Affairs. Tuesday’s ceremony also featured remarks from Associate Dean for Undergraduate Studies Billinda Tebbenhoff and Christopher Deering, senior associate dean and associate provost for the Virginia Science and Technology Campus. The value of the labs is in the opportunity for repeated practice, Dr. Tebbenhoff said. Simulation labs also provide the freedom to create complex ethical scenarios that students might not encounter during clinical training. In addition to a more hands-on environment, the labs are designed for instruction. 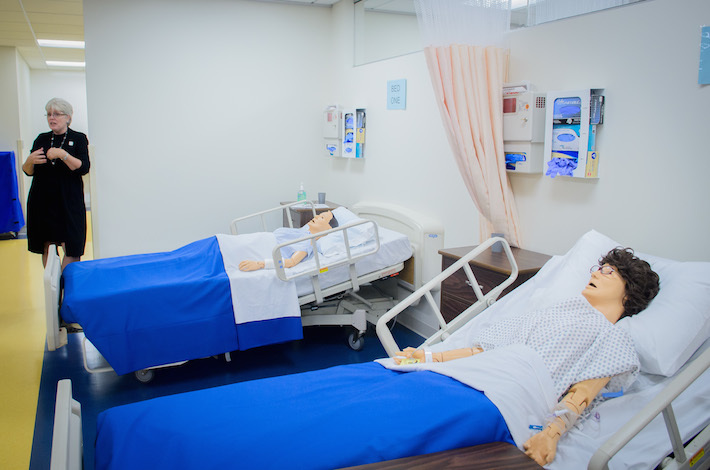 A control room with a two-way mirror is sandwiched between two simulation rooms with mid-fidelity mannequins, allowing faculty to observe students as they complete scenarios without affecting their decisions. Perhaps the most important space in the lab is the one without any technology. Tucked away in the corner is a small debriefing room. This is where the simulation exercise ends with instruction and discussion. “The debrief room is important—that’s where the learning happens, not only specific to that scenario but developing critical thinking pathways so they can apply it to other situations,” Dr. Davis said. He says there is a “significant need” for more health care professionals in Virginia. 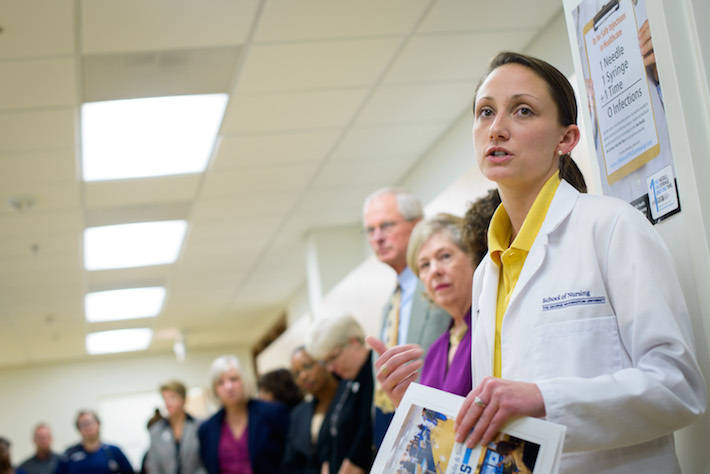 Eighth annual VASSA conference explores using simulation to improve health care.